Illinois State is launching a multiyear wireless upgrade project, starting this summer. Work is expected to get underway this summer on a major upgrade to Illinois State’s wireless Internet coverage, with students seeing improved access in some buildings as soon as this fall. The need for the upgrade can be seen in virtually any classroom. One student is likely to have at least a smart phone connecting to the wireless network, possibly a laptop or tablet too. That surge in wireless devices is straining the existing network, causing spotty coverage or making it hard to even connect. Now, Illinois State is launching a multiyear wireless upgrade project, starting this summer with large academic buildings such as Schroeder Hall and then hubs like Bone Student Center. The project, costing up to $2.1 million, was recently approved by Illinois State’s Board of Trustees. 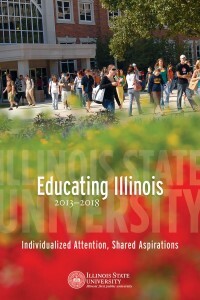 It’s a major step toward fulfilling Educating Illinois 2013-2018: Individualized Attention, Shared Aspirations, ISU’s strategic plan, which aims to build a modern IT infrastructure to support the University’s mission and goals. The stress of multiple devices on a wireless network is one of the top IT issues facing universities everywhere, not just Illinois State. A recent national study estimated that 60 percent of students have three or more web-capable devices that use wireless resources. Extensive, reliable coverage is now considered an expectation—not a perk—among students, making the project necessary to enhance Illinois State’s competitive advantage. It also plays a role in recruiting and retaining faculty, and facilitating day-to-day university business. Lackermann and the ION team will work with a new vendor, Aruba, on the project. It will target underserved high traffic areas including Milner Library, Bone Student Center, Student Services Building, Schroeder Hall, Stevenson Hall, Edwards Hall, Felmley Hall, DeGarmo Hall, and various open spaces around the Quad. The project was also shaped by feedback from students in a School of Information Technology class, taught by Lawson Cassels and Glen Sagers. The students recorded detailed information about wireless performance during three-hour Aruba tests last fall in Milner. Their tests led to better placement of wireless access points on each floor of Milner, and students were “excited and glad to be included in designing and improving a service they use every day,” said Sagers, an associate professor.